We went to see at least five home properties at Cocoa Beach today. The property that we like is the house that I call as a cottage house because the neighborhood is great and the backyard is huge. When my husband tried to check more information of the property, he found out that it was a HUD home and it needs some TLC. Hubby and I decided that we will keep on looking for more properties. The house that we like has more problems than what we saw from the naked eye. The other houses that we viewed today were all in a good neighborhood but, all were not ready to move in. We really do not like the trouble to do some fixes especially some major ones. It is just depressing to note that the sellers did not do extra effort to make the property sellable to the buyers. We were a property seller last year and we paint, did minor fixes, and maintain the landscape. Our property was sold and the buyer was happy. Oh well, we will just find the property that we want. We love our condo property but, it would be good to live in a house with our own backyard, right? First morning on the cruise - We arrived at Freeport Harbor Grand Bahama. The sun refused to shine but, at 7AM on October 18, this is the view that welcome us in the morning. I woke up my husband before 7AM because the sunrise was supposed to be 7:18 but, it barely come out from the clouds as you can see from the picture below. We had breakfast and by 8AM, we head down to the gangway and proceed to the exit of the port. Most of the guests took an organized shore excursion so; they had to check their tickets for the meeting time. 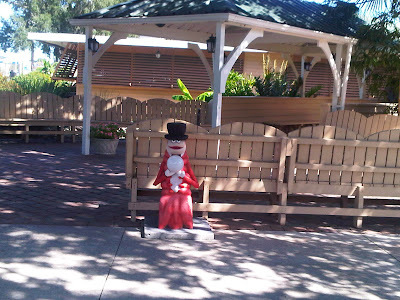 As for us, we want to explore the International Bazaar and Port Lucaya Marketplace and Marina. The fair is only $10 per person for the whole trip. It was a long ride of rural area and undeveloped places. There is nothing special really. Hubby and I decided to check in the Treasure Bay Casino at the Marina area and later on, we explore the International Marketplace where I bought my souvenir Freeport sports cap. Well, hubby won a bit when he used the slot machines. There is no cash out machine here so; you had to change it to their cashier. The rain poured so hard for maybe 10 minutes and it ceased! We return back to the cruise ship at 1PM because the weather was not that good. We stayed indoors and roaming to the Lucaya area and the Marina. It was a nice place and laid back but, there is nothing special here. The shoreline is just like the coastal view of Florida. When we head back, we took some pictures of the Freeport Port. The "I was there picture" LOL but, the cruise photographer had their $199 picture package which is unlimited. Most of the cruisers did not take advantage of the offer. It's way too high, I guess. We will be attending a Wedding in December and we will be traveling to Alabama. As early as today, we book our hotel room in the resort where the Wedding Reception will be held. My husband was also excited and been thinking about it so; he started sorting out guys shoes. He wanted to wear formal but comfortable shoes on that day because he wanted to enjoy the whole celebration. His foot easily gets sore especially with long hours of standing. He went to the walk-in closet and checks the shoe boxes at the top of the shelves. It took him few minutes to pick finally which pair to wear. Now, all he has to do is to find the formal attire that matches the classy shoes. My husband has the collection of shoes for formal events as well as sports shoes. He does not wear slippers because he is not used to wearing these type of footwear. Anyway, he realized that some of his collections were out-of-style in fact; he said he found pair of shoes that he will wear for the Halloween party. He will not let me see it yet. Oh well, he has this oozing excitement when he says it! When my cousin bought her red trendy plus size clothing, she was excited! Her best friend got married last Sunday and she attended the wedding. She's one of the usherettes. She wore the dress and she looks confident and lovely on her dress. She is an extra-ordinary woman and I am proud that she is my cousin. In the family, she has the beauty and the brain. We call her the intelligent one and have the kindest heart. I look up to her and though she is busy, she has the time to see me for a cup of coffee. When we talk, she would laugh about how I struggle to find my size when we go shopping one time. While she has a special area to find her plus size clothing, I simply go to the children's wear. She would tease me because I can fit the size 0 jeans. It was hard for me at that time because the styles of my jeans are for kids. She was having teary-eyed laughter's at my experience. Well for three years, I gain weight and achieved to size 3. Anyway, I am looking forward to see her again soon to have a bonding time with my favorite cousin. My phone bills give me headaches! Few more months and I am done with my 2-year contract and all the phone bill hassles will definitely end! I hate hidden charges and other fee that is why I am switching to a NET 10 phone soon. What Rob has to say must be true because he loves his phone now. Imagine a phone line with no contract, no credit checks and no hidden charges? Sweet! That is what I want now! Real NET10 customers are happy with the services they got plus, they are enjoying the excellent connectivity. With $50 a month, we can budget our phone bills yet, we will enjoy the unlimited talk, text and data. We can also access the Web using the NET 10 phones from the top brands such as Nokia, Samsung, Motorola and LG. We have the option to switch plans according to our airtime usage. We can also avail the $15 budget for an easy minutes plus plan which will give us 200 minutes usage and take note, there is no fee when we switch plans. This company cares for people and when we switch, it will definitely cut down our phone bills! My sister Helen called me today and told me that she’d been to wildbluedeals.com/satellite-internet/nebraska/ and switched internet providers. Helen told me that she was going to be saving money and still getting the service she needs. Helen has always been the responsible older sibling who figures everything out before I even take a second to consider it. I remember when we were kids and even in college, when it came time to register for classes, I wouldn’t have to think about what I should take because I knew Helen would always select the best courses for me based on her knowledge of the curriculum and the teachers. I then thought that she was bossy when she’d inform me on what I should do in any area of my life. Now I’m grateful that I don’t have to waste my time figuring everything out, and I welcome her advice. When I hung up the phone, I went online and explored the site she’d told me about. I discovered that I too could be getting a better deal on my internet, and ended up switching my service that same day. We have been planning to go cruising to Bahamas but, it was always postponed. Just two weeks ago, when I checked the NCL site, I showed him the itinerary and he loves it. His daughter and her boyfriend loves the route too so; without any further discussion, we book it. In two days time, we boarded the Norwegian Cruise Line (NCL). It was gloomy and as you can see, the floors were wet. It was drizzling whole day but, it was not that cold. In fact, it was relaxing to stay outdoors than staying inside the rooms. We enjoyed roaming the ship and familiarized the facilities of Norwegian Sky. The picture above is poolside area located on the 11th Deck. It has 4 Jacuzzis. While waiting for the ship to sail away to Bahamas, everyone goes to the Garden Restaurant which is located on the 11th Deck. When we boarded the ship, we were immediately guided to the Garden Buffet on the Aft section of the ship. Oh yeah! The first hour was eating time while the crew prepares the rooms of the guests. We boarded at 1PM and the ship was scheduled to leave Miami Port at 5PM. The activities started rolling in such as wine tasting and of course, the crew will really invite the guests to buy something. Guests like us started to wander the amenities while waiting for our rooms. We left our baggage at the baggage receiving area while we proceed to the Garden Buffet for lunch. As you can see, people started to wander the ship and take pictures and started making friends. I found two friends as a matter of fact and it was funny! I communicate through sign language because they can't speak English. They are Hispanic and an old couple an I had fun talking to them for four days. Anyway, you should socialize to enjoy the activities on the ship! Cruising at Norwegian Sky is the best because first of all, the crew is very friendly, accommodating, knowledgeable and polite. 90% of the crew consists of Filipinos and the rest was from India and Malaysia. Our servers are mostly Filipinos and even though we already pay for the gratuity, we still give them tips every time they give us an excellent service. I just hope you do the same folks:-) $10-$20 is not that bad. I have been planning for many months now to go back to school and pursue my Master's Degree. I have few subjects left and I wanted to enroll in an online school. I was able to work in one of the schools here but, I need more training. WaldenU.edu offers Walden University's online degree programs and I am currently checking on their courses. I want to work and at the same time finish my Master's Degree at my own pace. Therefore, online school would be my best option. Most of the people had to go back to school to change career path. That is my dilemma too because I am not sure if I like to teach and be in the Educational System. Working in a health related job inspired me a lot. I have been contemplating to work as a nurse too. It will take me years to finish this course but, it will be rewarding too. Anyway, I am trying to learn about Walden and checking what option I can get. Of course, I am not closing my door to teaching because I love to teach. What concerns me most is the availability of jobs in my area. I have more chances to land a job in health industry than in the school industry. Either way, I will enroll in an online course and that will be my goal. When I shop, I go to the junior apparel and I always buy medium size dresses. But just lately, I swear, I can fit a junior plus size clothing. In fact, I am wearing it now and it is very comfortable. I was a size 0 and I have been trying to gain weight for years now. Okay, this may sound weird but, I was working out to gain weight. I am so small that some people would think that I am a fifth grader. That is the reason I wanted to gain weight and I am happy to note that I am now a size 3. Few years back, I love to wear skinny jeans but lately, I am comfortable to wear slacks. The fabric also matters because I prefer soft materials. I am happier now than before because when I shop before, it was awkward because I was shopping in the children section. That was really embarrassing and my husband would tease me for that all the time. When I shop at the junior plus size clothing, I have more freedom to choose from because the sizes vary with the brand, I can fit a medium, large or plus size. These photos were taken during our road trip last month. 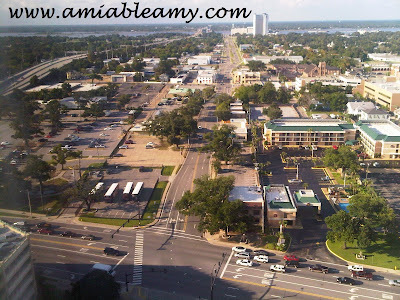 We travelled along the scenic view from Mississippi to Florida. 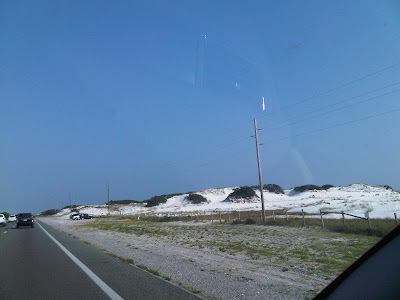 The picture below is sand dunes along the area going to Destin, Florida. We are in a low lying land because without that sand, you can already see the water. We are crossing the bridge and I saw yatchs down below. They are enjoying the blue water of Florida coast. 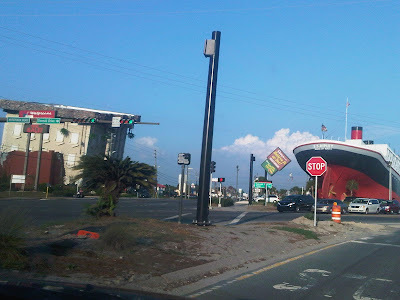 The picture below is Ripley's Believe It Or Not Odditorium and Ripley's Moving Theater located in Panama City. 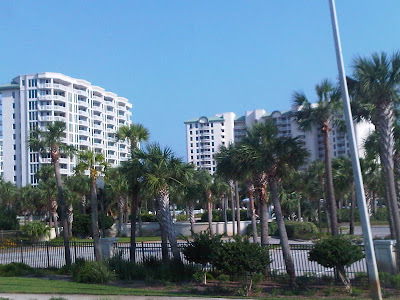 This place is nice, full of hotels and condos especially along the beach line. The long stretch of beach here is really beautiful with white sand and very clear water. You should visit Panama City. When my husband was tired driving, we decided to stay in this hotel. Most of the hotels along the beach area were fully occupied. This hotel had few rooms left so, we booked for one night. 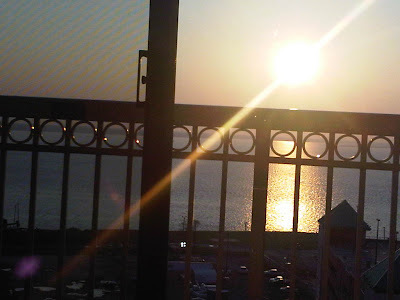 The room is not bad and the view of the Gulf is truly the best! 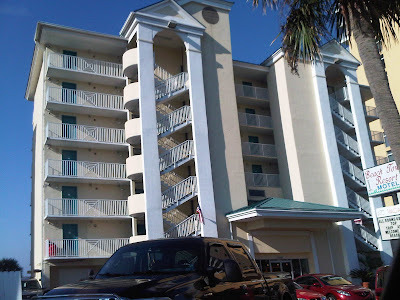 This is Beach Tower Resort and it is a small place which is good. 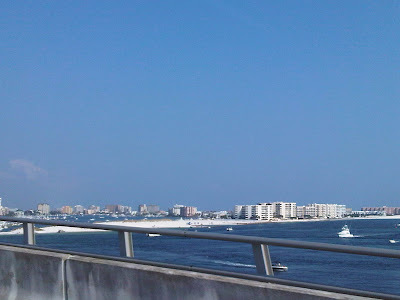 I can live in Panama City. I love this area. But, we do not want to live away from Orlando though. Anyway, if you want to have a vacation along the beach, cjeck out Panama City! You will love it here! I have been planning for many months now to go back to school and pursue my Master's Degree. I have few subjects left and I wanted to enroll in an online school. I was able to work in one of the schools here but, I need more training. I want to work and at the same time finish my Master's Degree at my own pace. Therefore, online school would be my best option. 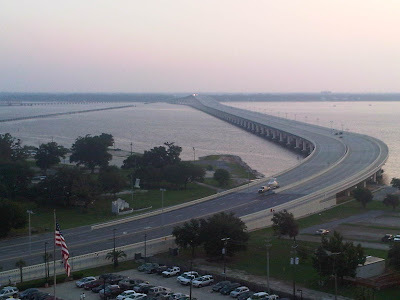 This is the bridge connecting two cities of Mississippi along the Gulf Coast, Biloxi and Ocean Springs. It's so beautiful right? The Isle is a hotel and a casino which is located at the tip of this bridge. 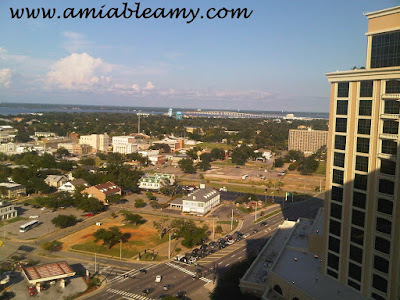 The Isle is in Biloxi so; across the bridge is Ocean Springs. 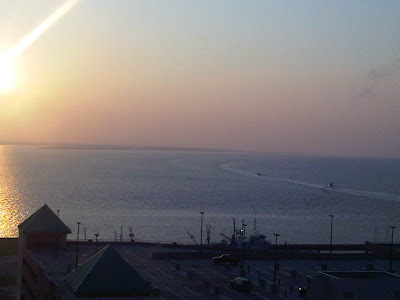 Still looking at the direction of Ocean Springs, the sunrise was really beautiful that day. 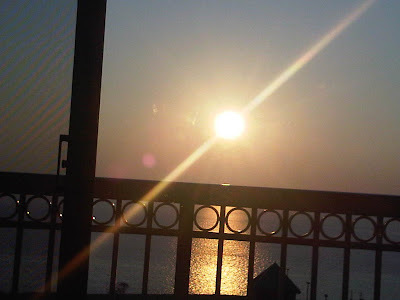 Since we have a balcony in the room, we can see the sunshine from the bed. That was an awesome sight! The bay was so calm that morning. The fishermen started to sail. Those are actually shrimp boats coming from the boat dock at the back of Hard Rock Biloxi. In this hotel, we stayed for a day only because we are done with the business transaction the day before. When there is no hurricane, the Gulf is a paradise! 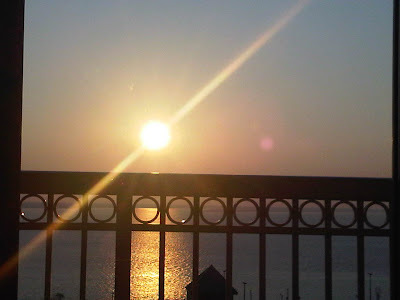 Imagine waking up seeing the sunshine glimmering like this. Down below is the parking spaces of the Isle and there are RV's that I saw which are parked down there. Parking your RV's would be okay. Parking space is never a problem down here. Anyway, hubby and I enjoyed our vacation here and we were able to attend a family important event too. We hope to comeback this Christmas or early next year. Note: I support the good cause of this group, please send your support to the information given below. "Mag-Bayanihan Tayong Mga Pinoy!" Guest Post: Antonio Levy S. Ingles, Jr.,Ph.D. Lenita Reyes Otadoy, Joanna Franquelli and Jyllyn Nicanor (Philippines Women's Sabre Fencing Team) have been chosen to compete in the upcoming SEA Games in Jakarta, Indonesia by the Philippine Fencing Association on November 13-18, 2011. To compete, they have to find sponsors, donors and patrons for their airfares, board and lodging and allowances (pocket money). Although their training in China is all expense-paid through the Philippine Fencing Association this October, unfortunately there is no more enough budget to shoulder their expenses on the actual days of competition. Each of them only needs Php 50,000 to pay for the above for their 10 day-stay in Jakarta. They are very much willing to put the company logo of the sponsors, donors and patrons in their uniforms. Please support them by finding a company/individual to sponsor them. Please Support The Philippines Women's Sabre Fencing Team! Please Support Lenita Reyes Otadoy, Joanna Franquelli and Jyllyn Nicanor! Professor Reyes-Otadoy PE Faculty of University of the Philippines (and my colleague here at De La Salle - College of Saint Benilde) was recognized as an Outstanding Athlete for bringing honor and glory to the country which she represented in various local and international tournaments and by winning several awards. Professor Reyes-Otadoy won the Silver Medal in the Annual Dayrit Cup Fencing Championships on June 19, 2009 and the Gold Medal in the same tournament in 2008. She also organized the UP Sabre Fencing Varsity Team which finally won the gold in UAAP. Antonio Levy S. Ingles, Jr.,Ph.D. Eradicate the complexity! If your company is growing, you should get a provider which is centralized in managing a Wi-Fi Access Points. It brings all your access points and administration tasks to the Cloud. It does not have any expensive dedicated hardware controller. If you are into the career path of IT managers and even Small Businesses, you can finally have enterprise level performance at affordable price. Anyway, cloud-based Wi-Fi Management is great because it communicates directly to all WiFi access point and it is compatible to any models. Imagine, it allows managing access points of multiple vendors and it is very affordable. It means more money for the bank. Get a high tech start up and yes, having to do this kind of service, they are on the top! This was developed by a networking enthusiasts who targeted that network management should be simple. It should be right? Technology and innovations should be easier and it should eradicate complications. This team of experts develop and market Tanaza which is a Wi-Fi Access Points management system. You should visit the link here for more information. Why settle for complicated Wi-Fi access points? If you keep wondering why the sales of your online business is not doing great, it only boils down to one reason, your SEO is not working right. Web Marketing and SEO go hand in hand to make an online business successful. Do something with your SEO to improve the visibility of your Website. By doing that, you will improve the traffic to your Website and that would mean, improving your sales also. If no one knows that you exist in the World Wide Web, your effort will be in vain. You need to improve your SEO now! When I travel from Cagayan de Oro City to Metro Manila in the Philippines, I booked my flight through Cebu Pacific Air. 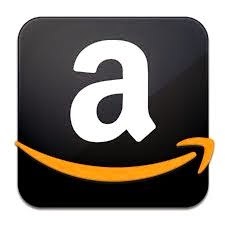 It's newer, bigger and the staff of this company are very accommodating, helpful and professional. That is why I patronized their airline company. Yesterday, I got an email notification about their seat sale for 12 pesos and that is less than $.25 cents either local flights or International flights. I always have an email notification every time they have a promotional sale. And all the time, I can't book any flights for they are sold fast. Guess what? I responded to their promotion and I was able to book a flight from Cagayan de Oro City to Metro Manila for my mother and my brother's family of 5. I was so amazed that I was able to booked successfully. It's my Valentines' Day gift for them and they will spend 6 days wandering the tourist attractions in Manila and visit our cousins. I thought of meeting them in Manila would be fun too (*v*). That will be a big surprise for them. And mama does not like surprises lol. We are tempted to book the Kuala Lumpur flight from Manila. That would be awesome and yap, same price! After I resigned from my work in Mississippi, I have been taking time for myself and concentrating on my sideline business online. But, I miss being "out there" and physically working in an office and having a normal routine to work. I guess I am ready to find a job but, I need to update my resume. Good thing I found the Resume Builder which has guide information on How to Write a Resume. I might see some new style. I am so excited to land on a new job this year. Of course, I am keeping my sideline business online too. Anyway, if you want to make a resume, this is a good Website to start with. 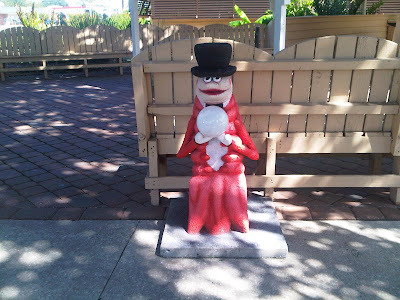 On the street of Garden in Titusville Florida, you will see this shrimp character on the side of the road. 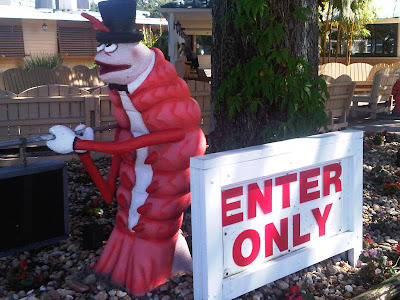 There are actually two shrimps standing charmingly along the entrance of the property. 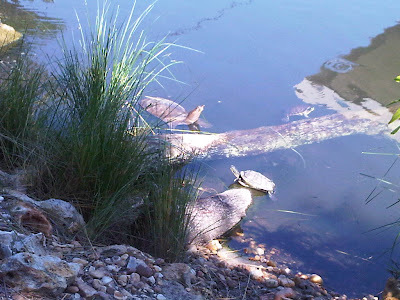 The pond has school of big fish and a family of turtles. Here is another shrimp, such a baby holding a round thing, maybe that's a light...just a guess. 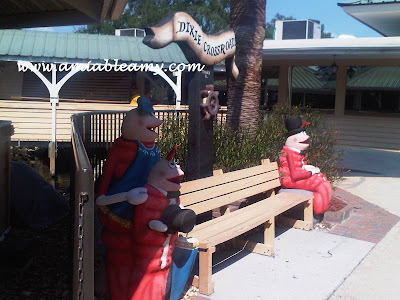 Here is the closer look of the shrimp on the side of this sitting area under the shed in the property of Dixie Crossroads. Check out the other pictures I took in this property. Click HERE. Do you have children? Here is the situation that I could think about when parents are rushing for work while the kids are watching their moves. Usually, little kids would wait for mommy in the bedroom and would watch her choosing her clothes. When you wear make-up, kids love to have a lipstick too. I bet, your daughter tried to put on your shoes right? How about your scrubs or uniforms? They love wearing it too but, the only set back is the size. How about giving your kids a surprise with lydias uniforms? When you check out the Website, it has children's scrub too. I bet they will be proud wearing the scrubs and that would inspire them to be a nurse or a doctor someday. Visit http://www.blueskyscrubs.com/ and you will see the selection of scrubs and nursing uniforms in variety of colors. They have scrub hat too and that could really fix your hair good. If you are planning to buy new set of scrubs, check out what is on sale. Did you know that you can buy a set of scrubs for $25 and that includes the original scrub pants and scrub tops for kids? Hurry! Purchase the product now and surprise your kids this week. 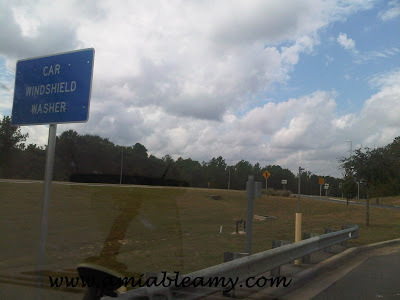 As we were driving the Interstate Highway along Florida towards Alabama, we noticed that the Car Windshield Washer was gone. Did they cut the budget for this free service for the motorists? I feel bad. The picture below is a car windshield washer area but, it is not working! What happen to the budget? We found one Rest Area that has this service and yep, it is still working but, it is not automatic anymore. You have to stop, turn the faucet and use the hose. You have to wash your windhield manually. Whewww! I have good news for those who love to win awesome prizes! Express will give away a $500 suiting makeover and this Express sweepstakes will run for a limited time only. So you need to join today and the good news does not stop there. The most exciting part is that you can enter daily for a chance to win this fabulous makeover. Oh I am so excited and I know you are too! The picture above is one of my favorite suits at Express. I love the design and the material it is made from. All my suits that I have in my closet are soft to the touch and very comfortable to wear. And this particular set is the kind of suit that I would wear especially when I have business meetings. What can you say about it? Look at the cut of the bottom and the design, it would really look on women's body. This suit is so elegant in style and anyone would look great on it. Visit the Website and check out the selection of women's suits. Which one would you prefer to wear? Are you looking for a particular style and design? I would love to hear it and your comments are most welcome here. We went to Disney World yesterday afternoon but, we parked at Contemporary Hotel because we had launched at the Wave Restaurant. We took the monorail because it will always pass by inside the Contemporary building. Yap, "inside the building", how cool is that? When we arrived the drop off station, we have two choices to ride to Magic Kingdom either ride the ferry or monorail once again. The monorail will reach the destination faster but, since we are just taking our time, we decided to have a ferry ride and that's what we did. Today, I posted my picture with goofy and pluto on my FB wall then, my brother asked me what's the family name of goofy. I didn't know that, LOL, do you? All I know is that the character of Goofy is clumsy, always mess up with the situation, incompetent, unable and unskillful. Though the personality created as such, goofy is one of the most lovable cartoon characters of Disney. Well, I enjoyed his short films together with Mickey and the cast of Mickey Mouse Friends. Oh yeah! I am still young...at heart! So, what's the family name then? Let me visit Disney next time and I will personally ask Goofy about his name okay? Meantime, try checking the name Benjamin. That is the name of Goofy's Paternal Parent so, probably Benjamin. Does anyone know? Raise your hands children. 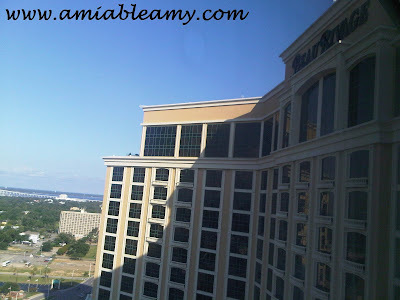 Beau Rivage is the largest and grand hotel in Biloxi, Mississippi. This property is one of the 16 MGM Resorts International Properties. Some of it's properties are the following: MGM Mirage, Aria, Bellagio, Mandalay, Luxor and many more. These are hotels and casinos respectively. 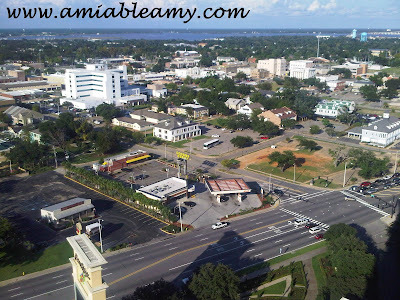 The picture shown here is the city of Biloxi. The water is the back bay of the Gulf. The tall building at the far end is another hotel and casino called the IP. 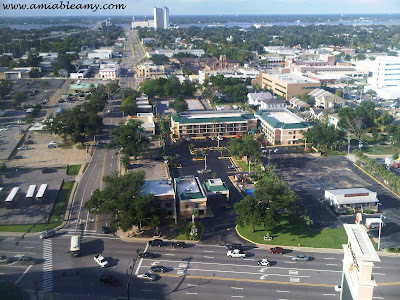 The green roof on the picture below is the Best Western Hotel. The room that we have is huge 400 sq feet, clean and the bathroom is gigantic with Italian marble floors, amazing feature! I love the deep soaking tub and the separate stall shower is a good layout. There was a third telephone line in the restroom. There was a hair dryer and beautiful make-up and shaving mirror but, no fridge in the room (another set back). We stayed on the 23rd level of the hotel. We love our room but, the only set back is the location of the room which is away from the elevator. We have to pass by 39 rooms to reach the room where we are because it was fully booked! Our room is really nice and considering we have it at reasonable price, it was all good. I would definitely come back and stay in this hotel. How was your business? With so much innovation and technology, advertising campaign should measure what the clients wanted in his job order. It will take creative minds aided with the latest software to create a beautiful advertisement. Finding the right Advertising Agency differs as to the positive results that they already created to their company. The Advertising Company should have the knowledge on Internet marketing, advertising and public relations as well as the social media aspects to help other companies. That Company is an expert on the processes to make SEO and PPC work to promote the clients Website. By doing such promotion, it eventually helps the clients business visible to the Internet users. If the business is visible online, it increases the number of visitors to the Website. If there are visitors or customers to the Website, it is possible that the sales will increase. Advertising really works and with the right company to tap and help you out, your business would definitely generate a positive outcome. SEO is an important tool so that your business will be known to the customers online. Your business should be searchable online and "That Company" will make it happen for you. It is the work of the advertising agency to promote your services and products to the local community. Your business online is nothing if no one knows that you exist. You need to hire this company to boost your SEO now. For more information, please visit the Website today or call them at 800-657-4179. Aren't they cute? They are shrimps and they are everywhere in the vicinity of Dixie Crossroads property. 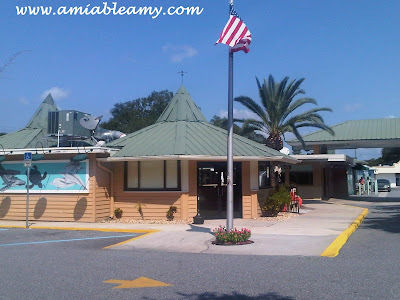 This is a restaurant located in Titusville Florida, famous for shrimps: reds, whites, pinks, hoppers, brownies and rock shrimps. I did not know there are so many varieties of shrimps because, my concern is just eat 'em. (grinning) This is the side of the restaurant as we walk to the entrance. This property is huge, with a good size pond, and the ambiance is warm and friendly. 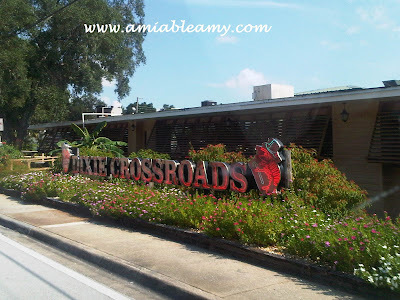 Along the side of the road, Dixie Crossroads would look like a flat building, nothing special but, inside the restaurant is crowded. That would mean, the business is doing great! 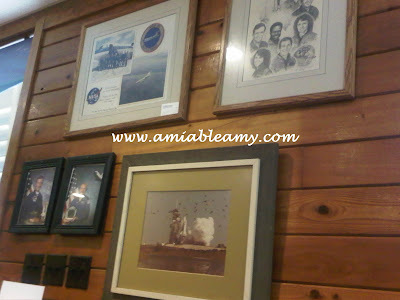 This is the wall decor of the restaurant and it emphasized the famous people who dine in to this restaurant mostly Astronauts. I recommend that you visit this place. If you are looking for shrimps, they have it for all season. The food is great and the prices are affordable. What else to say? Go! Other pictures is right HERE. Who is your favorite character? I still have to figure out myself in the coming episodes. This story will definitely unravel the motive of each character and that will be interesting to watch. The struggle to reach out the fame, fortune and power must be interesting to watch. Who do you think is the villain of the story? Do you think it is the developer or the councilman? I would really appreciate if you could share your thoughts about it. Feel free to leave your comments here.